Nancy Palomo and Emmett. Photo by Mitch Cohen. Giving Tuesday concludes the quintet of the holiday season gateway: the gratitude, grace and outright gluttony of Thanksgiving; the mad rush to tussle over door-buster prices on Black Friday and maybe start a brawl in the electronics aisle; the antidote to big-box shopping on Small-Business Saturday; the abandonment of that idea for clicking and buying on Cyber Monday; and finally, like Hope coming out of Pandora’s Box, using whatever you have left of your credit limit to donate on Giving Tuesday. Cash, however, doesn’t have to be the coin of the kingdom when it comes to beneficence. It also doesn’t have to take place on a Tuesday, and it certainly shouldn’t be limited to one day a year, but you all know that. The volunteers from Helen Sanders CatPAWS certainly do. 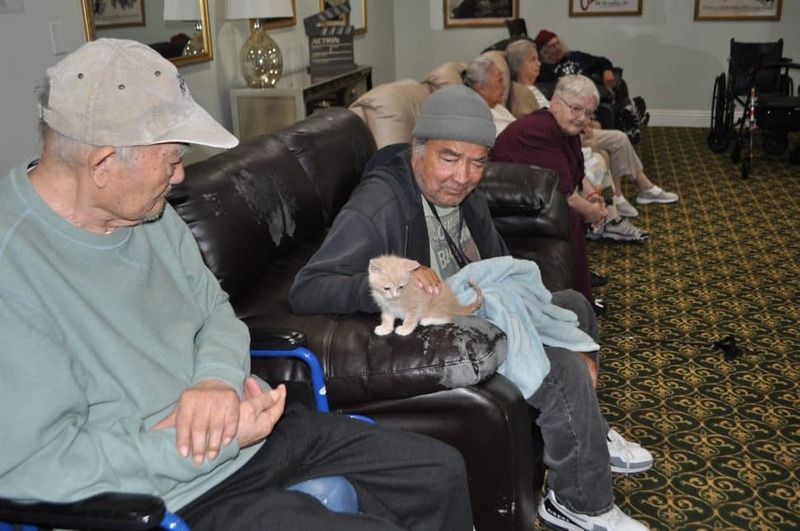 Once a month, generally the third Monday, CatPAWS plans to visit the Glen Park Long Beach assisted living facility, bearing kittens and delighting the residents. 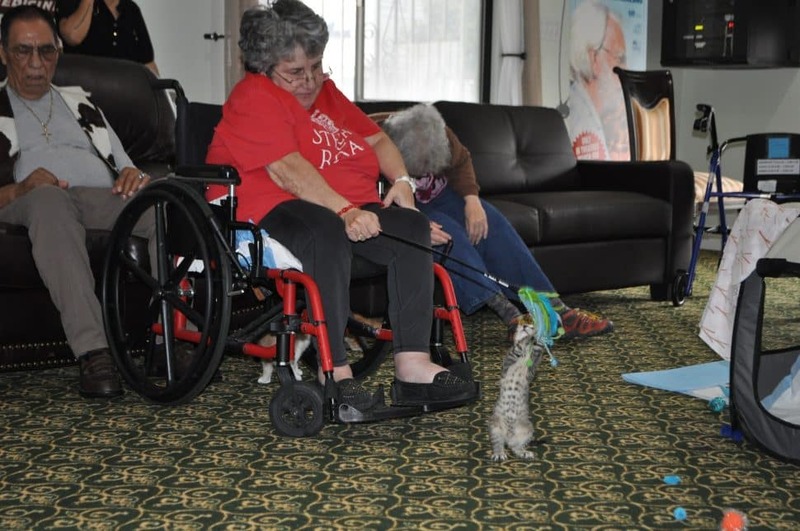 On their first visit, in October, they brought two kitties to see how they would work out with a small group of adoring people; the event was so successful that on Nov. 19, CatPAWS brought six to be sure that there was enough fuzzy to go around. 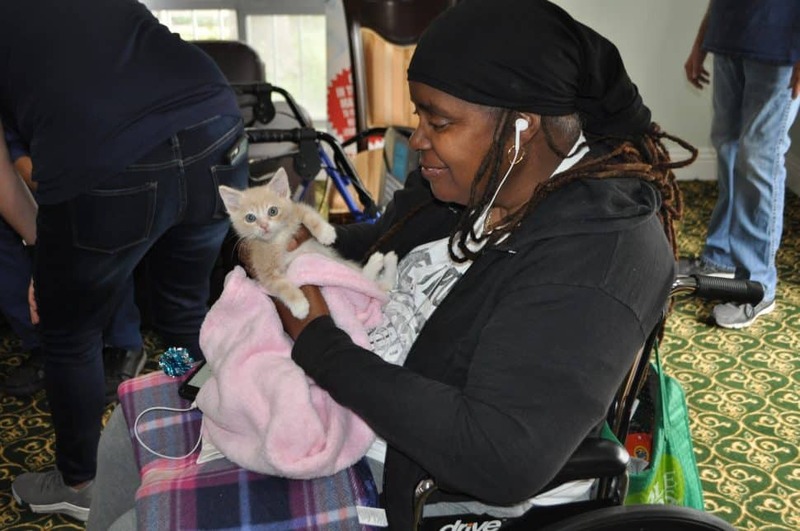 The residents sat, smiling, in rapt attention as volunteer Beth Lyons greeted them and introduced the kittens—Emmett, Everett, Susanna, Cosmo, Comet and Cyclone—and then presented them for some up-close cuddling. One woman, who said she was allergic to cats and couldn’t interact, sat contentedly on the sidelines and watched with pleasure. The 15 participants, some in wheelchairs, others quite frail, and a good many with plenty of energy and happy to engage, dangled toys for the little guys and gently handled them. It was as warm a sight to see as you’re imagining. Maldonado added that dogs also have their day at Glen Park when volunteers from another group brings therapy pets to visit. 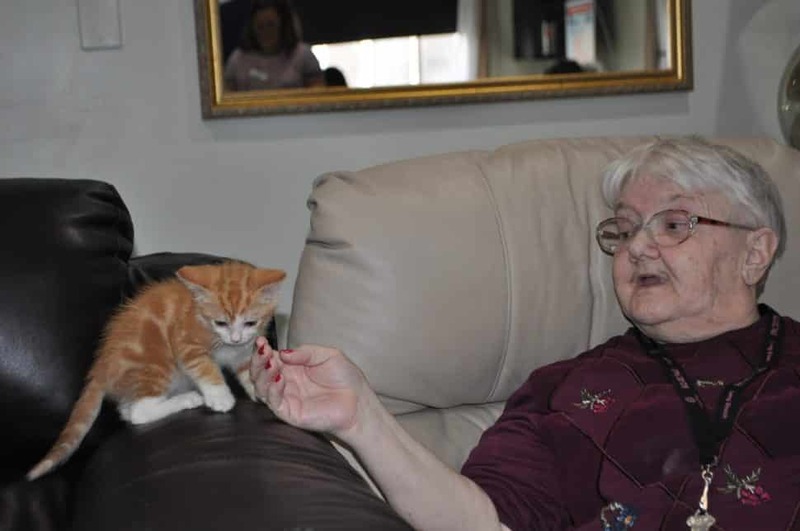 CatPAWS volunteer Deborah Felin was inspired to bring cats into the lives of the assisted-living residents through the memory of her friend, children’s author Priscilla Maltbie. 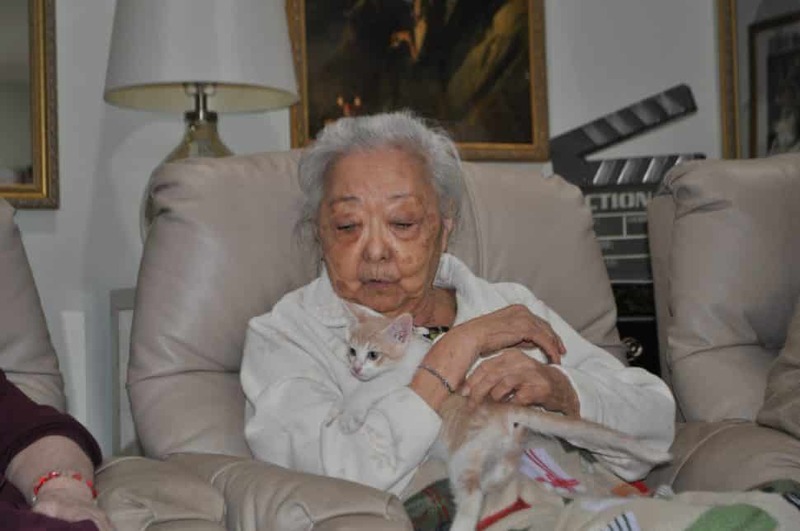 Maltbie, who made her home in Long Beach, interwove cats with historic artists and authors in her books. She died in 2014. 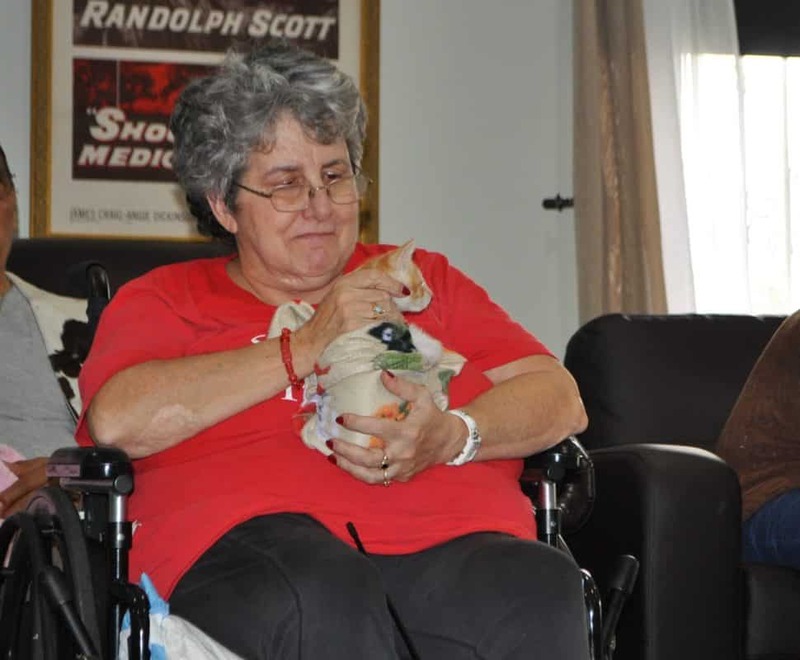 “It’s wonderful because we get to play with the cats,” agreed Nancy Palomo, Latsoudes’ friend. 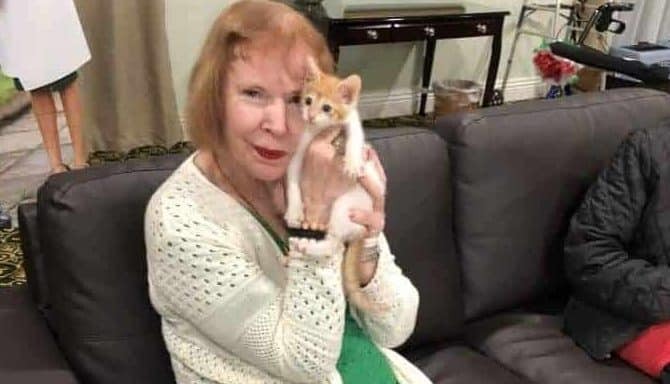 Not to influence you in any way, but all the kittens in the photo are adoptable through Helen Sanders CatPAWS, including little Everett—or Emmett—seen here with admirer Cleopatra Latsoudes and volunteer Diane Guyett. Follow this link to fill out an adoption application. You won’t be depriving the Glen Park residents of any of the kittens—there are always more on the way, and not enough homes for them.